I spent the summer clearing out. It started in May, actually, when my classroom began to feel like the walls were closing in. I needed space. Every day after school I would open something, fill the recycle bin, scrutinize and smile and either toss or find a new home. 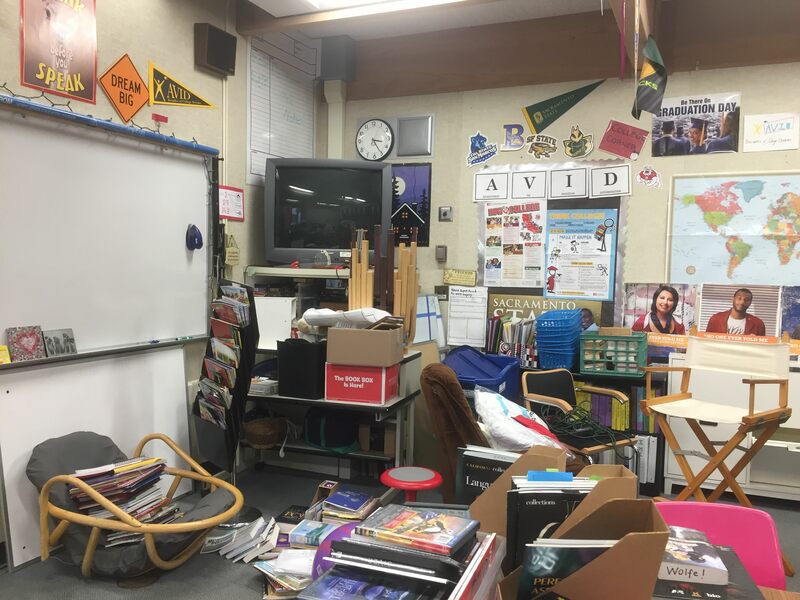 I turned my classroom inside out before leaving in June; when I came back in early July after the carpets had been scrubbed clean and all 900 square feet felt fresh and everything was stacked neatly on top of my tables. So of course, I flipped it all around. The back went to the front, the sides swapped spaces. Bean bags and folding chairs stacked in the center of the room on tables as I worked on creating more structure. I worked from the outside in, rearranging bookshelves and my teacher desk. I nestled new/old coffee tables in nooks with books and stools, and created AVID corners and reading spaces. Old paper ripped from the walls, became new blank bulletin board spaces. 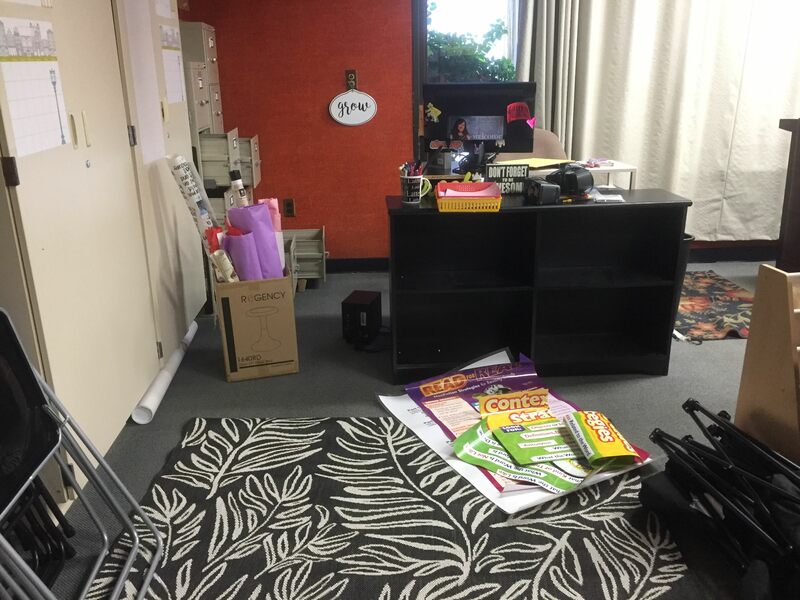 Wonder walls and student shout out spots smiled in anticipation of what would come in August… and I worked nearly all summer clearing out my classroom space until I could close the door and know that when school began August 27, I would be ready. At home, it wasn’t much different. The day after school let out in June, literally and figuratively, I opened drawers I hadn’t looked into for years. I pulled out all the linens and papers and blankets and stuff….and then I gently lifted them, breathed in the scent of memories and either gently folded and returned them to a place of honor, or let them go. I knew what was propelling me, that life was tipping out of balance and only by clearing, by bringing awareness to the places in my life that I habitate and nest deeply, would I embrace all the change. Before the end of July, I cleared out nearly every room in my house. It was messy, and yes, a bit incomplete. There were tears of joy and overwhelming washes of memories that brought me down. I couldn’t go one room at a time; rather, I seemed to spiral from here to there depending on how the spirit moved me. It didn’t make much sense, but inevitably after I completed one part, an ease came over me. A sense of completion, of control, of calm. Vaclav Havel said, “I am not sure one is capable of reflecting absurdity without having a strong sense of meaning. Absurdity makes sense only against a meaningful background. It is the deeper meaning that is shedding light on the absurdity. There must be a vanish point, a metaphysical horizon if you will where absurdity and meaning merge.” Shedding layers of ‘stuff’ allowed me to shine a light on what means the most – it allowed the ‘absurdity and meaning’ of 22 years of parenting to merge and push me towards what was not only meaningful but possible. It became a daily practice. Like an addict, I fed on the need to bring balance and order. To create space for the change to wash in and out while my baby, my teenage son, wandered in and out of the house as he relished his last few months in the only home he’s ever known. I spent much of the summer alone, in solitude. Aside from the obligatory summer excursions with the family (which I loved), I stayed at home, happily filling my days with clearing. May Sarton once said, “There is no place more intimate than the spirit alone,” and for me, the intimacy brought with clearing out gave me time to think. What would this next phase of life be like, alone with just a husband and a dog and no children in and out all day? What would my teaching transform into? For 22 of my last 28 years of ‘first days of school,’ I’ve juggled being that teacher-mom, trying not to show how I was always feeling split in two. And to be honest, I have no idea. Two weeks after dropping off C at college and starting the new school year the very next day, my rhythm isn’t there yet. I’m exhausted, edgy, eager, curious, nervous, and mostly cannot imagine how to jump-start creativity. Seems like with all this clearing, with all this open space I should be oozing with ideas and the time to bring them to the surface. It’s making me a bit frightened, actually. I want to force it into shape, to dump it all out and mold a plan that seems unmistakenly possible. Things need to fall into place before me, wide and clear and clean. 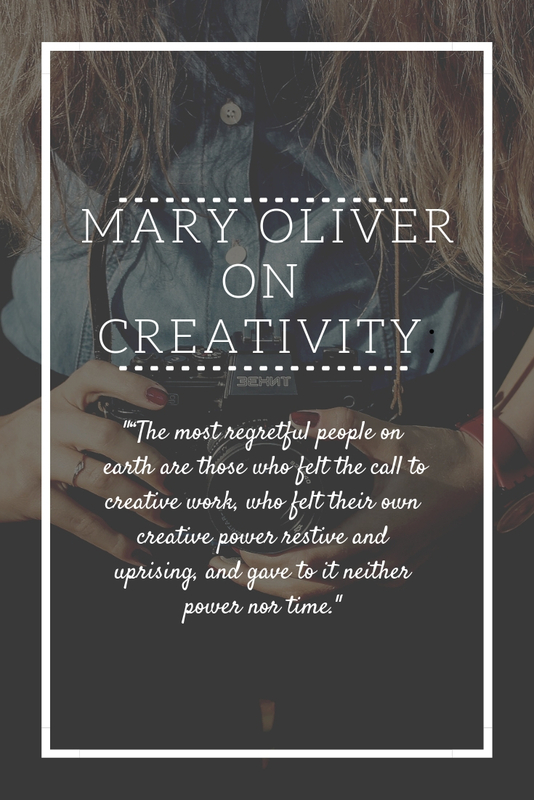 I feel the call to creative work – the years and years under me, of thinking about this time and feeling the foundation that I’ve been building with this blog, with my PLN. with my pushing myself into something that while at times cloudy and obscure, it seems like might just be starting to glitter. I don’t want to push down this clearing and cleansing and creativity that is opening right in front of my eyes. I want to jump in, feet first, and see where I pop up, to give myself permission to fill those empty shelves with new ideas and opportunities. And maybe, embracing the change for once, not shrinking from it. Just as the smoke is finally clearing from the summer skies, I know this will happen. Eventually.